As far as birthdays go, I believe this last weekend was by far the most therapeutic (mentally that is). My experience was one which made me realize why we get into such a thing as mountain biking in the first place. 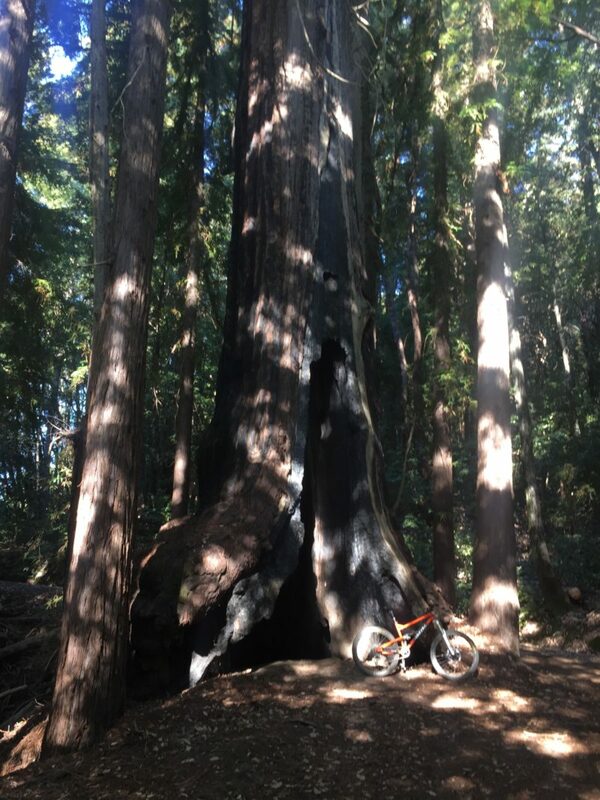 It wasn’t just a fun ride, the abundance of natural beauty in the Santa Cruz redwoods was breathtaking. Perhaps enough to fill a dozen roadside postcards and maybe some left over for a nature film! Let me set the scenario. My girlfriend asked me how I’d like to spend my birthday in Santa Cruz, to which I replied, “yes, of course!” Now this birthday did come with one caveat in the form of having to spend the day alone while she attended Zero motorcycle’s 10th birthday party. She dropped me off at a trailhead 1,623 feet above the Pacific. Now as Murphy’s Law would have it, I had forgotten to “preload” maps on my phone and as expected… I had no reception for miles from my drop off point in Soquel. 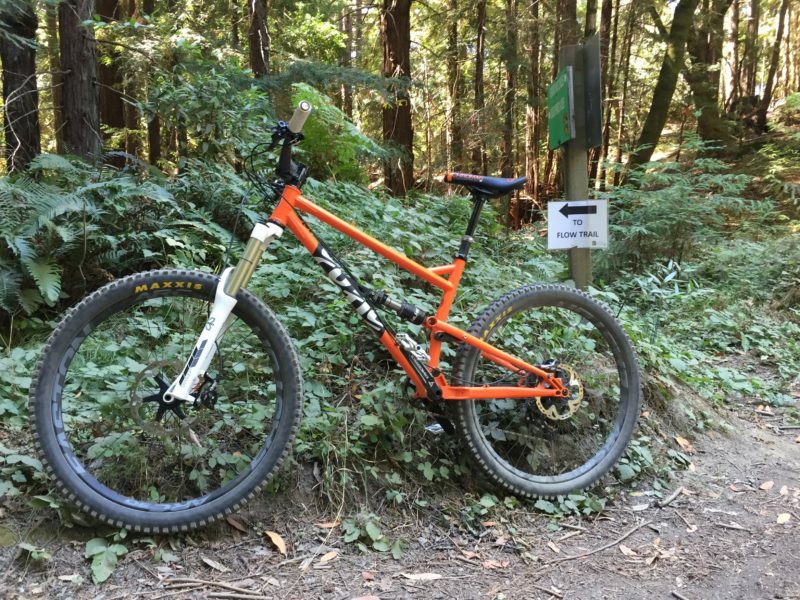 I had checked the MTB Project trail map of Soquel Demo Forest so I had some idea of where I wanted to go, but no idea how the path would present itself. I muttered something like, “meet you in Aptos” and went on my merry way. Aptos is a long ride from Soquel, but that was the plan. The long ride ahead weighed heavy on my mind as I pedaled up away from the road, having no idea where I was going. I kept looking at my phone which had 50% battery and 0% reception. My first mistake was to turn on Strava which only sped my battery’s demise. I rode along what seemed like a logical direction which was uphill and wondered how the heck I was going to meet my love in Aptos. Will I make it? Will I get lost in the woods? There were people here, but surely not many are going some 20 miles south through the Forest of Nisene Marks to the town of Aptos, CA. What if I get eaten by a mountain lion? Are there bears around here? Mostly I wondered…. Can I survive the night out here? How cold will it be? I’m sure it’s a testament to my nature that these thoughts did not keep me from continuing to pedal up to the top of Soquel Demo Forest. I had after all just built a long travel mountain bike and I was dying to try out this “flow trail” thing they got out here! By nature, I am not an introvert. I crave and enjoy talking to people and if you ever happen to find yourself in front of me on a trail, you can be sure to get at least a “hello” from me. I believe in politeness, after all. We’re all here on this planet so briefly, and we all deserve at least an acknowledgment of each other’s existence. I quickly realized that our phones, our GPS and all the technology we rely upon while we are supposedly “escaping it all” on the trail may actually hinder our experience. People became my GPS, along with some trial and error, and the people made my ride so much richer. Throughout the ride, I met some great folks all too eager to share their favorite trails and tell me the history of the area. I rode the flow trail with a local named John who beat me going down that trail and will soon be turning 60! I rode the climb back up to a fire road that leads some 17 miles down to Aptos with some kind riders that found me again after a wrong turn which led me downhill for a quarter mile (keep going uphill they said). Princess Dirt Monster, Hank’s Arch-Nemesis. My legs were cramping after riding up and down all over Soquel and Nisene. I have no idea how many miles I rode or how many feet climbed. I do know I rode from 11:30am to 6pm all grin inducing, awe inspiring hours. As some serendipitous miracle my girlfriend found me right away after calling Epicenter, the bike shop nearest to the parking area the MTB Project app suggests. “Yeah he came through here, we sent him to burger.” “burger.”, yes burger with a period at the end. She walked in just as I was settling into my burger. What a way to punctuate a wonderful day!